November 26, 2011 January 22, 2012 Rosana Francescato3 Comments on Solar for all! Over a year ago, I began my quest to solarize my condo complex. I’m still working on that — but even if (I mean, when!) we manage to get solar for the common electricity and hot water, there’s not enough room on the roof to power all the units. So what do we do? In my research, I’ve come across a number of promising community solar options that can help us all participate in solar power. 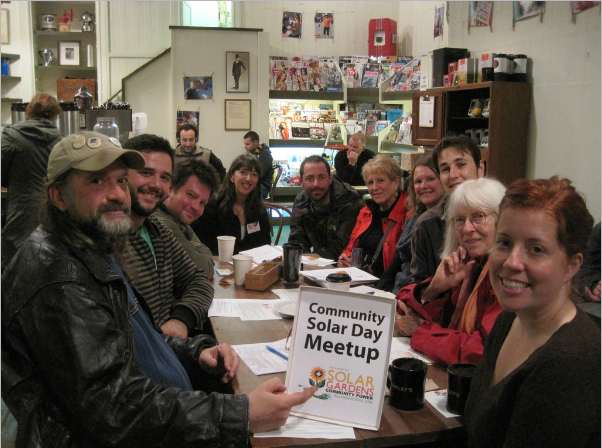 Just some of the 15 solar enthusiasts gathered at Farley's Cafe in San Francisco last weekend. Thanks to Kristina Shih of Solar Mosaic for this photo. And what better time to learn about some of these than last Sunday at Community Solar Day. Solar Mosaic, which provides one of these options, conceived of this event to jump-start solar projects in people’s communities, and many others joined in to sponsor events all over the world. Solar Gardens Institute: Promoting solar gardens, which allow people who can’t put solar on their roof (renters, condo dwellers, those with shaded roofs, etc.) to subscribe to solar from panels at a nearby site, while saving money on their electric bills. Solar Mosaic: Crowd-funding solar installations on community buildings, thereby enabling regular people to participate in solar — for just $100, you can help spread solar in your community. It’s like owning a bit of solar, just not on your roof. San Francisco Energy Cooperative: Creating a greener, cleaner San Francisco while making the profits from that transition available to everyone. You can become a member at varying amounts, so it’s accessible to all. Everybody Solar: Providing solar to local charities. You can donate any amount and pick the organization your donation goes to — again allowing all to participate in solar. These are just a few of the local and national community power groups in a movement that’s suddenly everywhere. Being part of the community solar movement is great. By investing in, donating to, or volunteering for the organizations listed above, you can participate in the movement at little cost. What if you also want your own power to come from solar, but you rent, live in a condo, plan to move, or can’t get solar for any other reason? If that’s your situation, solar gardens could be a good option for you. Colorado, Delaware, Maine, Massachusetts, Vermont, and Washington already have solar gardens laws. In California, we’ll be watching SB 843, which would make solar gardens possible here. Support SB 843 and other local and national legislation — see Vote Solar and watch this blog for updates. Spread the word about community solar. As a community endeavor, this movement needs all of us to participate. Together, we can bring solar to all! Pingback: Solar for all — even condo dwellers! Next Grid parity is here!